His main focus was school and the hard work that came with it, he said. Now that he is established as a business professor at OCCC, Pichop has devoted himself to helping others achieve their dreams. Pichop is involved around campus. He participates in and monitors multiple business clubs for students, including Kappa Beta Delta, Multicultural Business Club and Students in Free Enterprise. As a youth in Cameroon, Pichop spent his free time constructing his own toys, playing soccer and helping his parents work around the family farm. Pichop had an early interest in becoming a banker. In school, he said, his favorite subjects were mathematics and science so he focused on these two things to try and achieve his goal. 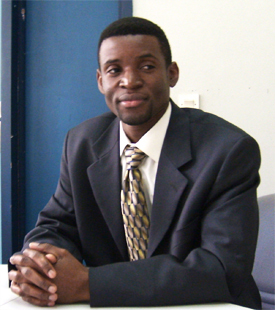 In 1996, Pichop studied at the International Relations Institute of Cameroon, where he obtained his master’s degree. In 1998, his dream of coming to America to study finally came true and he took full advantage of it. Pichop came to Oklahoma after being awarded a Fulbright Scholarship to pursue a doctorate in agricultural and applied economics at Oklahoma State University in Stillwater. Since then his main motivation has been making a difference in people’s lives and passing on the teachings he received. Pichop has been working at OCCC full time since 2008. He serves as professor of business and economics, co-director of the Center of Excellence, International Business, and department chair for the business program. Prior to coming to OCCC, Pichop worked for the World Vegetable Center as an economist and agribusiness specialist. One thing Pichop wants students to know is the importance of business skills, he said. “A lot of students believe that they do not need business until they graduate,” Pichop said. “After graduation, they go on to work in an organization. All organizations use the same business principles whether they are for profit or not. To contact Clayton Hooper, email onlineeditor@occc.edu.